Thanks to Fair Trade L.A. for hosting us, and thanks to everyone who stopped by. And remember, if you want to buy the movie, go to FilmBaby or Fuller Bookstore! The Sun Valley Spiritual Film Festival is happening this weekend, and director Lauralee Farrer is in Idaho to speak at the screening of The Fair Trade movie. Articles about the event can be found here and here. Thanks to all of those in attendance! We’ll post a wrap-up as soon as the event is finished. Lauralee Farrer, director and producer of The Fair Trade movie, is doing some radio interviews this week in support of the Sun Valley Spiritual Film Festival (The Fair Trade is an official selection). On Wednesday morning, September 17, she sits down with Lenny Joseph of KECH (103.5) in Sun Valley. Afterwards, she will head over to KYZK (107.5) for an interview with deejay Bob. We join with the Anti-Body team in prayerful support of Anti-Body’s intern, Racheal. She was in the Chatsworth Metrolink train accident yesterday and is in critical condition. She’s in the middle of brain surgery and has sustained major head trauma, as well as other injuries. Racheal has interned with Anti-Body one day a week because she wants to develop her own line of skincare products. She graduated from the University of Zambia, and is now a student at the Fashion Institute of Design & Merchandising. She and a fellow student in Zambia won a competition with their business plan to study in the US with a goal to study hard and gain as much experience as possible before returning to Zambia. Please join us with your thoughts and prayers as the doctors work to nurse Racheal back. Anti-Body (the company that Tamara Johnston started with her twin sister Shelby and Shelby’s husband Steve in The Fair Trade movie) has a new video up, and it’s about the cool people that are working together to make fair trade skin care products. 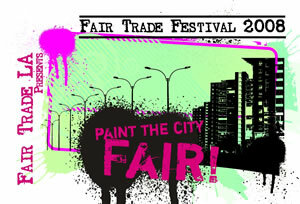 The Fair Trade movie is coming to the UK! Check this out. A really cool event called Souled Out ’08 is showing The Fair Trade on Saturday, October 4th, at the Aberdeen Exhibition and Conference Center. Check out their website for event details. It is showing at 3:30 and 5:30 in the afternoon. Come and check it out! Says director Martin J. Clarke, “We’re really excited about what this will add to our programme.” Thanks! We’re excited, too. Rotating Mirror is a cycle of short films made from a process where impromptu Super 8 footage was shot every day for one year. The year took place between birthdays, so the project is a personal journey and reflection on life through multiple settings and situations. It is a contemplative, poetic body of work that, although born out of a very subjective relationship between the director and his surroundings, compels the viewer to make their own associations and readings, and question the experience of time, urban living, contrasts of environment, and the mysteries of life through the particular language of film and montage. As such, it places the mundane within the context of the infinite, so that one may experience a unique angle of beauty within both. Seeing the personal in the infinite, and vice versa, as it were, and being open to the sensations and ‘story’ that results. The film is comprised of 14 chapters and represents a cinematic ‘year’, separated by x-ray footage of the Sun as a visual drone and indication of seasons. Members of the band Rachel’s composed the music and sound pieces that accompany the chapters. The relationship of sound to image is critical in this work, and influenced many editing and structural decisions. Boston screening of The Fair Trade movie: success! Hi!!! Saw it, loved it, talked about it, still talking about it, bought it…! There was also a rep from http://www.bostonfaithjustice.org/ who set up a table, handed out fair trade pamphlets, and spoke at the end of the film as well. Thanks again to Boston Faith and Justice Network and The Crossing for sponsoring this screening, as well as our Travis Hardy for making the contacts.